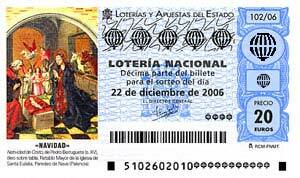 The Spanish El Gordo (The Fat One) Christmas Lottery is the richest lottery in the world with prizes of a massive €2.1 Billion. The jackpot prize is €4 Million and the remaining €2 Billion is split into prizes from €200 to €1.25 Million. It is the only lottery in the world to make 100’s of new millionaires. The draw is held every year in Madrid on December 22nd. It is known locally as Sorteo Extraordinario de Navidad or Loteria de Navidad. More than 98% of people living in Spain buy a ticket and now you can too by playing online. Play at MyLotto24 – MyLotto24 is by far the cheapest way of playing the El Gordo Lottery. You can get 1/100 of a ticket for as little as £4.99, 1/50 for £8.98, 1/20 for £19.99 right up to a full ticket for £249. Plus by registering with our special link you will get a discount on almost every ticket! Play at WinTrillions – By playing the Christmas El Gordo at WinTrillions you can buy 1/10th of a ticket for £60 each or a full ticket for £550 each. (Includes all taxes and fees) Alternatively, you can choose to increase your chances and play in their El Gordo Syndicate. In the syndicate, you pay £32.50 for a share of 100 full tickets with a 1 in 7 chance of winning a prize. If you win a prize it is divided equally with the other 250 members of the syndicate. The odds of winning one of the 160 jackpot prizes of €4 Million is a very low 100,000 to 1 when you compare this with the 115,000,000 to 1 chance of winning the EuroMillions you really do have a good chance. In fact, the chance of winning the El Gordo jackpot is probably better than any other lottery in the world. Even if you don’t get the jackpot 15 tickets out of every 100 will win a prize. This means you have a better than 1 in 7 chance of winning at least €1000! The draw is Spain is considered a National Event and one of the major social events of the year. People in Spain will hold fancy dress parties, parades and other festivities in the hours leading up to and well after the draw has ended. It is held in Madrid on the 22nd December. Unlike other lotteries where the results are quick the El Gordo Christmas Lottery draw last for 3 hours due to the sheer number of prizes. The balls are drawn from 2 machines which in Spain are called ‘Bombos.’ Each machine holds thousands of balls. On each ball in the first machine, a number combination is printed and the balls in the second machine are printed with a prize value. Each number on the balls from machine 1 is printed on people’s tickets so when that ticket number is drawn they win the corresponding prize drawn from the ball in the second machine. In this respect, the El Gordo draw is more like a raffle than a standard lottery as we know it. The total prize pool stands at a massive €2.24 Billion. The jackpot of €511 Million is split up into 160 smaller jackpot prizes including €4 Million to the winner. (El Gordo) Below the jackpot, there are a further 5 main prize tiers. The second prize after the €4 Million is an impressive €1.25 Million down to the lowest tier which still pays €1000. 9,999 more players get €200 refund. (cost of full ticket) There are over 10,000 prizes awarded on the night of the draw. Tickets for the El Gordo de Navidad are very expensive costing €200 each so rather than play a full ticket most people will buy ‘decimos’ which are 1/10th of a ticket. The cost of a decimo is €20 and pays out 10% of the published prize. When playing online you can buy as little as 1/100 of a full ticket which means you get 1% of the total prize should you win. As well as the El Gordo Christmas Lottery there is also the El Nino New Year draw which is held on the 6th January 2017. The El Nino or ‘The Little One’ marks the last day of the holiday season before people living in Spain go back to work. El Nino works the same as El Gordo although the tickets are a little cheaper. You can purchase a full book or 1/10th of a book called a ticket. The guaranteed jackpot for the El Nino 2016 is €630 Million with a jackpot of €90 Million. The jackpot is split 45 times with the winners each getting €2 Million. The second tier pays out €750,000 and the lowest tier still pays out an impressive €1000. You can play the El Nino New Year Raffle 2019 in a syndicate or you can purchase a full book at Wintrillions. i first time to log in wintrilion .. i hope i can win ..thank you ..